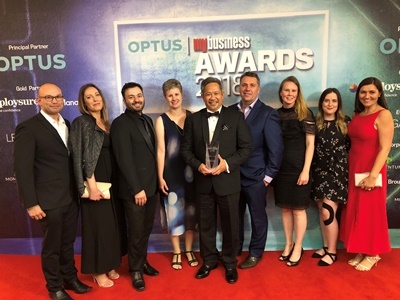 AUSRALIAN owned and operated destination expert for 25 years, Beyond Travel, has won the 2018 Travel and Tourism Business of the Year at Fridays (November 10) sold out black tie Optus My Business Awards, Australia’s longest-standing business awards program. The event was held at The Star in Sydney with over 800 business leaders in attendance. The Travel and Tourism award category included small and medium sized enterprises including hotels, accommodation, bed and breakfasts, souvenir shops, tour operators, tourist attractions and experiences, travel agencies, booking services and other tourism related businesses. CEO Michael Lavilles says, “This award is a wonderful recognition for the entire Beyond Travel team. It is a testament to the teams passion for the industry, the destinations and the products we provide to the Australian market combined with their dedication to our agents and clients that has enabled us to win this prestigious award. “It is a proud moment to be recognised by fellow businesses for the hard work and effort that goes in each day to consistently build and improve our business within the travel and tourism market”. Independently judged by an expert panel, there is a five stage process for the successful candidate to pass based on numerous aspects including business culture, staff development, USP’s and competitive advantages and strategic approach to developing new, repeat and referred business.